Hi there, Simon here. 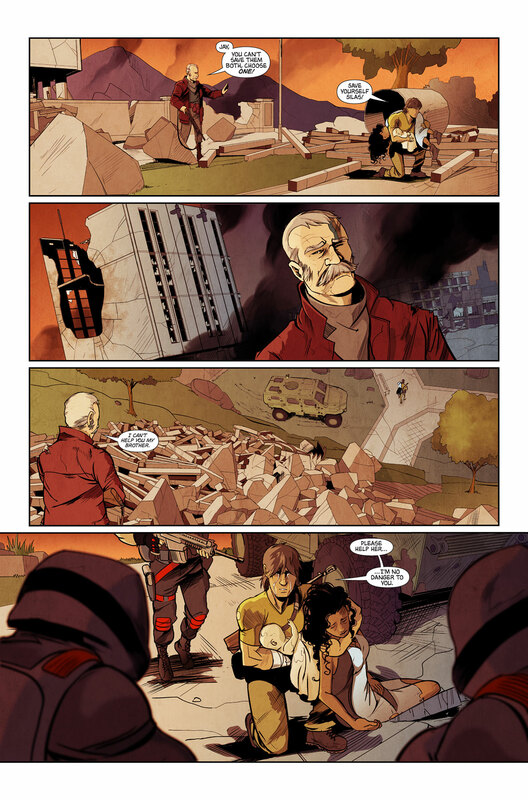 I am the colourist and letterer on Digitopia. Farhan has asked me to write a little about my work on page 4 of the comic and hopefully share a little of my thoughts and processes with you. I will focus on the colouring for this page and perhaps write about my approach to lettering on a future page. 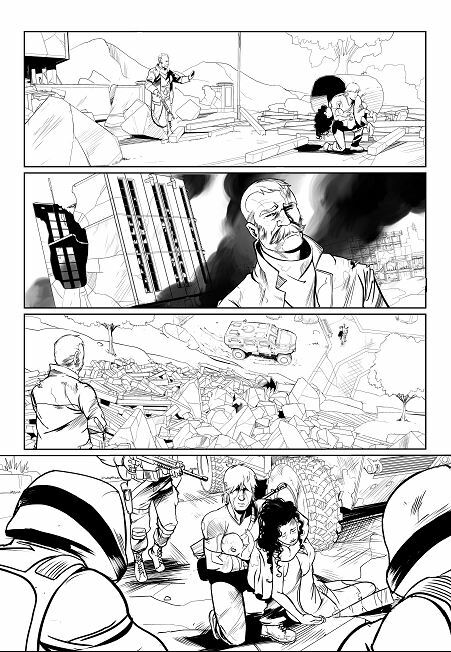 After receiving the inks from Sebastian I look at the page and determine which elements need to be focused on or highlighted, which are main storytelling cues and develop a basic idea in my mind’s eye about how I need to colour the page. For this page I wanted to communicate the desperation of Jay, the helplessness of Silas and a sense of foreboding with Jay & Reema’s capture by the Confederate army. So my approach in regards to the colour palette was to take the reds & oranges from page 3 and introduce some more blues & purples as well as some darker values to increase the drama of the scene. Panels 2 and 4 struck me as the two that conveyed the most emotion and divulged the most about the characters and situation they were in. 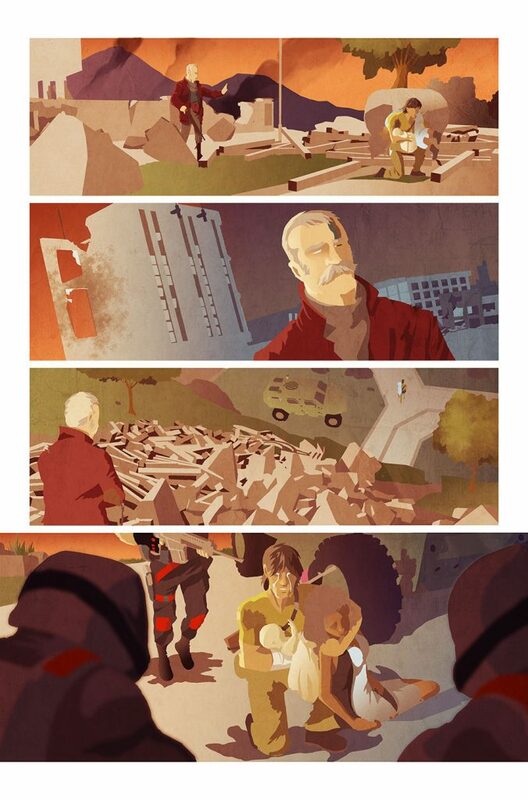 Therefore it was these two panels that I wanted to standout and deliver the most impact. To achieve this I used a more gentle transition in colours for panels 1 & 3 which, when coupled with Sebastian’s choice of shot length and composition, allows the viewers eyes over and around the panel and be distanced from the scene. In contrast panel 2 is a more distinct red & blue palette with a stronger contrast that draws the viewer’s eye to Silas and hopefully conveys the internal torment he is feeling at not helping his friend. 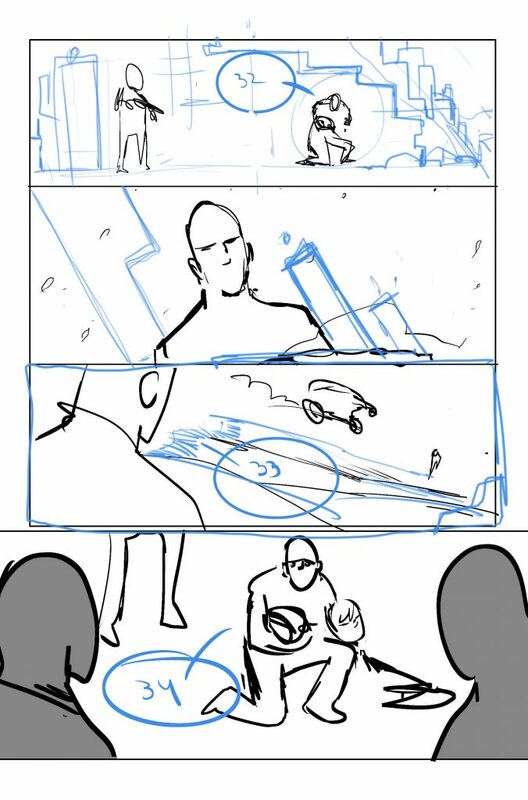 The shot length, angles and composition Sebastian used here mean the viewer is drawn closer to the subjects and are more intimately involved in these panels. I also wanted to communicate that Jay was moving away from the light, warmth and towards the darkness and cold. A metaphor for losing his freedom. In the final panel I wanted to combine the palettes from panel 1 and panel 2 to reinforce what I am trying to communicate in them. I also aimed to illustrate that Jay’s path back to freedom is blocked by the soldiers and the only direction he could travel now is off panel to the right and into the darkness. I also placed Reema more in shadow to imply she is mortally wounded and fading from the world. In contrast the baby is highlighted to show new hope and life. A lot of consideration goes into the colouring of a comic and I hope this has helped shed a little light on the thought processes behind the colours used in Digitopia. Jay makes his decision, he yanks an unconscious Reema up. impossible odds to a low level exit. Silas shakes his head at the bad decision that Jay made. I can’t help you my brother. Back on Jay he comes to a dead-end. sub machine guns trained on him. his wife taking her last few breaths. I’m unarmed, I’m no danger to you. They never told us it would be like this. SFX: The cries of the baby. Close up of JAY’s face, a desperate pleading expression. silhouetted Silas scrambling up to a perch above. Silas’ POV he can see Jay is cornered by the soldiers. Jay why didn’t you come with me? SFX (OP): LARGE FOOTSTEPS CRUNCHING THROUGH THE GROUND. Thanks for reading, be sure to hit ‘Like‘ and fill in the ‘subscribe‘ form below to be the first to get the next page of the adventure, stay up to date with the latest developments and find out how you can get your own copy.